Our tailored flat notes are perfect for all of your correspondence needs. 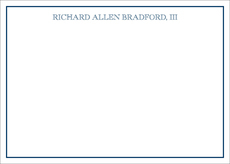 Size of note cards is 7" X 5" Flat printed in with ink color as shown using typestyle of your choice. Printed return address with flat Navy ink available. Positioning only as shown. If bullet point ( · ) is wanted, please include in personalization.